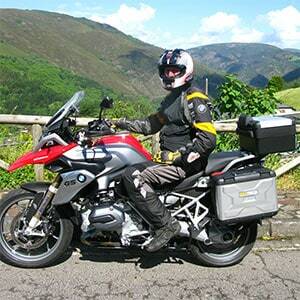 Is an International Driving Permit required for IMTBike tours and rentals? Yes it is required by law in all European Countries and will make any dealings with the local police much easier! To get one, please contact your local Automobile Association for the nearest office to you. Normally International Driver’s Licenses are made while you wait and are inexpensive. How far will we ride each day? We ride between 200-400 kilometers (160-250 miles) per day depending on the type of roads; sweepers, mountain twisties or long desert straights. We always make stops ever 1-1.5 hours for a good photo opportunity, a beverage, and always for a nice lunch. How many riders are there on each tour? IMTBike likes to keep its tour groups small and personal. There are usually 8 to 12 people on each tour. This is the perfect size so our guides can become friends with all tour members. The dress code is casual and our van will transport your luggage. Apart from your riding gear (helmet, jacket, pants, rain gear etc.) you should bring a bathing suit, t-shirts, jeans, shorts, and sweater. Our handbook, which you’ll receive at least two weeks prior to the start of the tour, will have all the pre-tour information (clothing, customs, and arrival), hotel list and route details. Yes, a helmet is required by Spanish law. IMTBike recommends using a full face helmet. Can I purchase additional medical coverage? Yes, Medj et provides its Air Medical Transfer membership program on a voluntary purchase basis to North American clients of IMTBike. Individual and family Medjet members that become hospitalized 150 miles or more from home are eligible for air medical transfer services to a home country “hospital of their choice” in time of need. Zero cost out of pocket for the services coordinated by Medjet. The protection is valid during business or personal travel – domestic and international. Motorcycle Transfer Protection for domestic travel within the U.S. (excluding Hawaii) Canada and Mexico is available as a membership upgrade option. Learn More and Enroll? Persons from the U.S., Canada or Mexico can visit Medjet online at www.Medjet.com/IMTBike or call Medjet at 800.527.7478 or 205.595.6626. Enroll prior to travel and reference IMTBIKE if calling. Reduced annual Medjet membership rates for IMTBIKE clients from North America under age 75 start at $250. Multi-year and short-term rates are also available. Rules and Regulations available online and provided with Member ID cards. Who are the other riders on the tour? Our tour members come from around the world which adds to the fun of the experience as you get to share riding tales from your different countries. What extra cash will I need? You’ll need cash for lunches, snacks, gas, personal expenses, tolls and tips. Yes you can bring your own motorcycle, and it can be any make or model. If you use your own motorcycle then you pay the passenger price instead of the rider price. IMTBike has a support van to carry your luggage and any additional items that you purchase along the way. There is also room for a few non-riding passengers in our van. What are the rest days? The rest days are scheduled at points of cultural, scenic, or recreational interest, usually after several days of riding. It is a chance to relax and enjoy the culture or ride and explore new scenic locations. You are free to explore towns and cities on your own. We also provide you with riding routes, if you choose to ride on the rest day. How experienced are the other riders on the tour? The riders have different skill levels. Some have been riding for years and are highly skilled, others have been riding for only a few years and ride at a more relaxed pace. You can always ride at your own pace and you should always stay within your comfort zone. This is very important to us! Many riders have been able to improve their skills by riding with our guides who are all expert motorcyclists that are happy to give you pointers that will make you a safer rider. Can my club or group of friends design its own route? IMTBike will custom-design a route to your specifications and desires with a minimum of 10 tour members. So if your motorcycle club or group of friends is interested in organizing a unique tour all you have to do is contact us. How do your self-guided tours work? All IMTBIKE tours can be converted into “self-guided tours.” You just need to tell us which tour you are interested in and the dates that work best for you. We will organize the tour for you just like one of our organized tours except there will be no guides. An IMTBIKE guides will meet you the first night of your tour to go over the route and answer any questions you may have. Our self-guided tours also include a GPS with the route pre-loaded so it is easy to ride on your own. To calculate the cost of a self-guided tour you need to take 20% off of the rider and passenger tour prices.